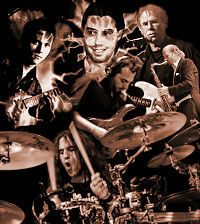 Doracor is without hesitation one of my fav italian prog bands for many years, I found them very inspired band with consistent albums and very solid musicianship on every album. I review two albums in the near past Tranzitione and Lady Roma and I found them quite intresting and well played, now is time for another goody from this little know symphonic prog band from Italy. Onirika is the title of their sixth release, issued in 2007 at same Mellow records. 5 pieces grace the album, each one divided in some more smaller parts. This type of symphonic prog I like a lot, very melodic, tons of waving keybords, nice elegant guitar arrangements, complicated twists on each instrument. Violin and sax appear here and there giving a very unique sound and atmosphere. The vocal lines are sung by a male Milton Damia and female singer, especially the song Il Giardino Di Peitra contains a great performance by Gianna Chilla, excellent choirs overall. So, overall very nice album, at same level with Tranzitione or Lady Roma, that means solid. From me easy 4 stars, elegant and intresting release. Doracor definetly needs a far more recognition worldwide, to me is one of the best symphonic prog bands Italy ever had and has. Very nice arwork like on previous releases.